Thanks to all who responded to the SAC Survey. Your input is very valuable to further develop the contest for the upcoming years. The survey has been compiled into a downloadable report, in order to give feedback to everyone interested in SAC. 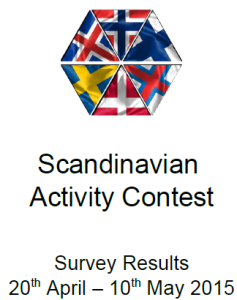 One highlight from the survey is that we need to keep up and increase the activity from Scandinavia in order to make SAC more attractive for everyone. Another thing we need to look into is to further clarify some of the current rules. Overall SAC is highly appreciated all over the world, something to be proud of. Download the sac-survey-results-2015 (PDF) and take some time to read it through. Especially the free text comments are very interesting. 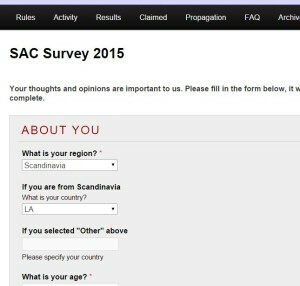 There are only a few days left before we close the SAC Survey 2015 on the 10th of May. Please take a few minutes of your time and give us some feedback on SAC. Your feedback is important to us! Go to SAC Survey 2015 now! The SAC 2014 Results Booklet is now available in PDF format (5 Mb) for your reading pleasure, here. 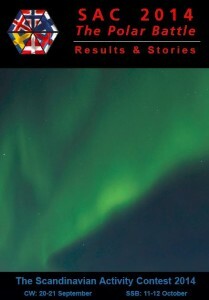 It contains the full contest results, along with contest stories written by participants from different parts of the world. Thanks to all who contributed to the booklet, and to Flemming, OZ8XW, for taking care of the layout! We’d also like to invite you to take a survey on SAC. We are eager to develop the contest in the best possible manner, and obtaining your input is crucial to this process. The previous SAC survey from 2012 led to direct changes as inspired by your input, and we feel that now is an opportune time to measure “the pulse” again. Please click here to enter the survey, and spread the word to your friends as well. The survey will be available until Sunday, May 10th, after which we will summarize and publish the results.